U.Va. Center for Politics Director Larry J. Sabato is contributing a regular column to Politico Magazine. 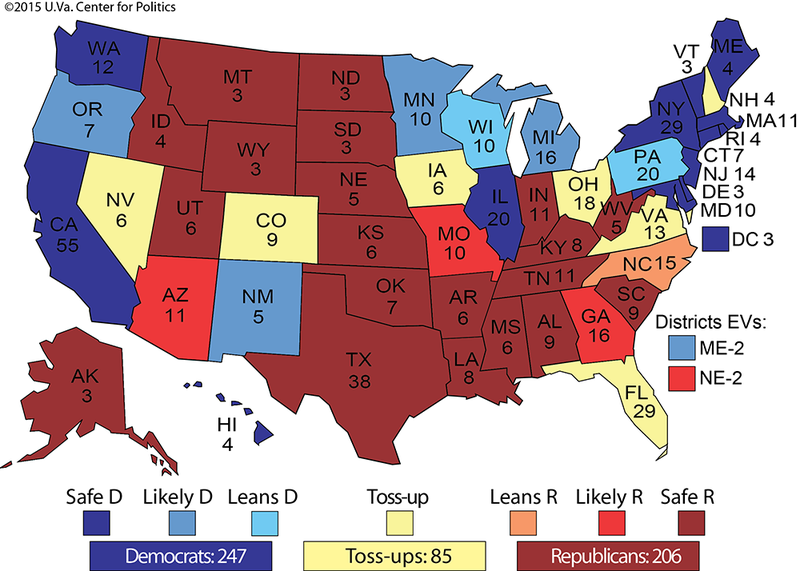 This week, the Crystal Ball team takes an initial look at the Electoral College, and how most states have remained relatively predictable in their partisan leanings. A version of this article originally appeared in Politico Magazine on May 3, 2015. We elaborate further on the Electoral College landscape in the lead piece in this week’s newsletter. On the other hand, Republicans must hold all their usual states plus find a way to stitch together an additional 64 electoral votes, or 79 if they can’t hold North Carolina. To do this, the GOP candidate will have to come close to sweeping the toss-ups under most scenarios — a difficult task unless the election year’s fundamentals (President Obama’s job approval, economic conditions, war and peace, and so on) are moving powerfully against the Democrats. It is possible, maybe quite plausible, that any new Republican path to Electoral College victory will wend through the whiter-than-average industrial Midwest, but as of now it’s more likely to expect the GOP’s electoral map to look much like George W. Bush’s narrow route to the White House — a solid South, rural Midwest and Rocky Mountain majority. One could argue that we’re giving the Democrats short shrift by not calling rapidly diversifying North Carolina a toss-up, or leaning Nevada to them because of its growing and largely Democratic Hispanic vote. But if one assumes that the 2016 outcome will be closer than Obama’s 2012 national victory margin of four percentage points — and that is a reasonable working assumption 18 months in advance of Election Day — then Nevada should be tight while North Carolina would take on a reddish hue.